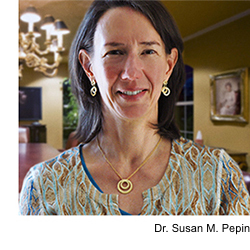 The Board of Trustees of Virginia G. Piper Charitable Trust announced today that Dr. Susan M. Pepin, nationally recognized medical educator, clinician, and researcher, will become the next president and CEO of Virginia G. Piper Charitable Trust, effective July 28, 2014. Dr. Pepin currently serves as Associate Dean for Diversity and Inclusion and Associate Professor of Surgery and Pediatrics at Geisel School of Medicine at Dartmouth. Recognized for her work to diversify the student body in the medical school and as a leader in the field of neuro-ophthalmology, she holds a B.A. from Yale University, B.A. and M.A. from University of Oxford, and M.D. from University of California, San Francisco. In June she will receive a Master of Public Health from the Dartmouth Institute for Health Policy & Clinical Practice. She is a former Rhodes Scholar.